TIJUANA - El Gringo paid his driver and stepped out of the cab and into the crisp November afternoon in the Zona Rio neighborhood of Tijuana. Shielding my eyes from the autumn sun, I looked up at the modern glass and concrete business tower that houses Chef Javier Plascencia’s Mision 19 restaurant. 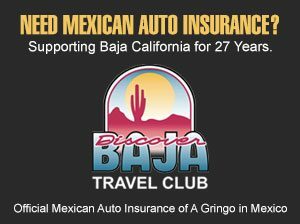 Mision 19 has become famous in the past few years – as has the chef himself – thanks to some high profile articles in both the New York and LA Times and a burgeoning foodie interest in the city’s Baja Med cuisine. But every tower begins with a cornerstone, and El Gringo was here to chat with Javier and his brothers Tana and Julian to uncover the foundation of the Plascencia family’s history and culinary influences and get the story behind the Grupo Plascencia family of restaurants. Javier and Tana Plascencia at Mision 19 in Tijuana. Grupo Plascencia’s culinary traditions run deep, and have many branches. Stepping into the bright, open interior of Mision 19, I was seated at a small table behind the impressive wine wall where I met Javier and his brother Juan José (aka. Tana, the oldest of the four Plascencia siblings) to discuss Grupo Plascencia’s roots, the trunk and it’s branches. And to find out how they’ll continue to help shape Tijuana’s constantly evolving culinary scene. Mision 19, Javier Plascenia’s flagship restaurant in Zona Rio, Tijuana. The Plascencia Grandmother, Nana Chela, at Agua Caliente in the 1930’s. As Javier reminisced, a pianist played “Somewhere Over the Rainbow” in the background, a fitting soundtrack for the story of his father, Juan José Plascencia, a Tijuana barman who started a restaurant empire in 1969 with a dream – a dream of having a good pizza in his hometown. Influenced by frequent trips to dine and drink with friends at San Diego’s Filipe’s Pizzeria, Tijuana native Juan José Plascencia (aka. Don Tana) hosted a party for his coworkers one night, found some recipes and baked a couple of pizzas for them. They loved the pies and urged him to open a restaurant of his own. Juan José and some friends got the money together and opened their first restaurant – Giuseppi’s, largely credited as being the first pizzeria in Mexico. Nana Chela made the sauces and his wife Martha (from San Diego) worked the cash register. Within two hours of opening, they sold out and the new pizzeria was a huge success, becoming a popular gathering spot in Tijuana. Wanting them to be fluent English speakers, all of the Plascencia kids were educated in their Mother’s hometown of San Diego. Javier attended the Army/Navy Academy in Carlsbad for a year, and all of the boys attended Saint Augustine in San Diego for high school. In the meantime, the Plascencia family empire just across the border in Tijuana continued to expand. Juan José hired a cook and a helper and began adding a bit more variety to Giuseppi’s Italian menu, including lasagna, poultry, veal and meat dishes. Building on the success of the first location, the family added more pizzerias across Tijuana. 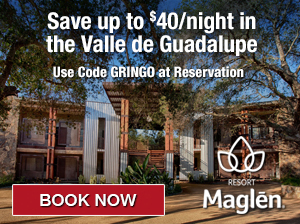 There are currently 5 locations, the 6th is planned to open on Tijuana’s main drag, Avenida Revolucion, in 2014. In 1988, Juan José rented the space adjacent to the first Giussepi’s and set it up as a specialty dining room with a more “exclusive” Italian menu, naming it Villa Saverios. Working with a business partner from Mexico City, the family created one of the first restaurants in Tijuana that combined both Baja and Mediterranean flavors…helping set the stage for the city’s current success with Baja Med cuisine. The restaurant recently recognized its 25th Anniversary, during which all the chefs from Grupo Plascencia contributed their culinary talents for a week of celebratory meals. The Plascencias then opened Casa Plasencia, the family’s flagship restaurant, displacing and moving Saverios ultimately to its current location. Serving “Mexiterranean” cuisine, the menu features Spanish, Italian, Greek and Arab-influenced dishes. El Gringo had dinner there earlier this year after the Tijuana Art Walk, and everything – including their signature beef cheek tacos – was delicious! In 2005, the Plascencia family went into self-exile, fleeing Tijuana for San Diego due to kidnapping threats made against one of the brothers. Grupo Plascencia opened Romesco in Bonita, California (near San Diego) in 2006 so that they and their friends – also temporarily displaced for similar reasons – could enjoy a Mediterranean style meal with Baja flavors away from home. Romesco is still in business today and has received many accolades for their imaginative menu (it’s also an El Gringo favorite). The Plascencias have tastefully rehabilitated, renovated and resurrected this Tijuana landmark, which dates back to 1927 when Caesar Cardini (an Italian immigrant) started the his namesake restaurant during the the city’s prohibition boom. Cardini is popularly credited with the invention of the classic Caesar Salad, which is still served table side using the same ingredients today. The original Caesar’s opened in Tijuana in 1927. After our chat with Javier at Mision 19, Tana drove me over to Caesar’s for a quick tour, some food and wine and to meet with his brother Julian. Caesar’s walls are adorned with hundreds of historic photos of the restaurant, hotel and Tijuana from the 1920’s through the present day. The original bar is the only thing that remains from the 1927 Caesar’s, but the entire restaurant has been styled in a way that recalls Tijuana’s classic era of wining, dining, and gambling — including black and white checkered tile floors, mahogany wainscoting and leather upholstered chairs and booths. Step back in time at Grupo Plascencia’s Caesar’s in Tijuana. Sitting down at a table by the bar with Tana and Julian, El Gringo enjoyed a glass of the house Pale Ale (Caesar’s, brewed by a local cervezeria), the house red wine (Nostro, or “We” in Italian), Caesar Salad, bone marrow sopes (“Sometimes I come here and just have these and some red wine,” Tana confided) and Caesar’s version of the surf and turf, chateaubriand and bacon-wrapped Baja shrimp. The staff was friendly, the company was excellent, the atmosphere was inviting and the food was excellent. Nostro, or “We” in Italian, is the Plascencia’s house wine and bears the family logo. In addition to the Grupo Plascencia interests, Javier independently manages several other popular restaurants, including Erizo Baja Fish House & Market in Tijuana and Finca Altozano in the Valle de Guadalupe, his successful outdoor campestre kitchen. Younger Sister Margu creates dulces and pastries at L’Artisan Reposteria Fina, which supplies tantalizing deserts to most of the Grupo Plascencia and other Tijuana restaurants. Tana and Julian are always on the lookout for the next opportunity, such as Mama Tequila, their new tequila bar just across the street from Caesar’s. 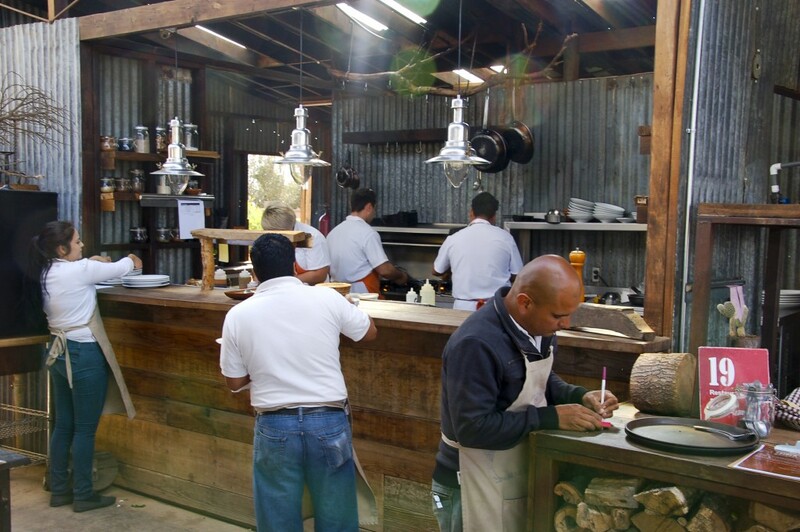 Finca Altozano, Javier Plascencia’s Valle de Guadalupe restaurant. There are plans to develop new concepts and restaurants, both in Tijuana and possibly other locations in Baja California such as Rosarito, but all three brothers made it clear that for now, they are focusing on Tijuana and its continuing revitalization. “Because we are mostly in Tijuana, the family goes around to all the restaurants every day. We get to see our diners and they get a good feeling of personal service.” Julian emphasized. When the family gets together for a holiday or celebration, they typically meet at one of their restaurants and leave the cooking to the capable staff, some of which have been with the Plascencias for 30 years. The family beach house provides a great place for Juan José to gather his grandkids around him and for the family to take a break from the demands of their profession. The roots of that tree will no doubt run deep. Excellent piece on culinary delights south of the border! It was a delectable read…write on! Gracias Denise! And you have fantastic taste in friends. Tana, Javier and Julian were all very generous with their time and I loved learning about the family history through their stories and recollections. Wow amigo, this is a great great article. !! I love it thank you so much for share.